In October 2018, Google announced that they would be shutting down all Google+ pages. In recent weeks, they’ve been sending out a round of reminders warning users that they would be deleting the Google+ accounts officially on April 2. Google says it will delete your photos, video content, posts and community pages. The deletion process won’t be immediate, however. It’s likely to take a couple months for Google to get around to deleting all the content across Google+. After all, there are 2 billion Google+ users, and many of those are business pages. Why is Google Deleting Google+? The simple answer: security issues. In the fall of 2018, Google said that 50 million users were impacted by a bug that was a part of an update which gave app developers access to users’ profile information. In addition to a data leak, a deeper answer to the deletion has a lot to do with the use of the social platform. Think about the last time you used it, or when the last time you intentionally published a post from your community to the platform. You may be doing it subconsciously through a social publishing platform as so many users do. According to Google, 90% of users’ sessions are less than five seconds long. Google+ has not taken off as other social platforms like Facebook or Pinterest. Still, you may have posts, videos or photos you want to save before Google+ goes away for good. Does This Impact Google My Business? Your Google My Business listing is safe, along with any photos or virtual tours you have uploaded to your listing. Google announced on their Google+ Help center that no other Google products would be affected by the shutdown. There is a major misconception between the relation of Google+ and Google My Business. The two are completely different entities with distinct purposes (Google+ is a social platform, Google My Business is a business page for Search and Maps visibility). What made this confusing over the years is that you could link the two together, with Google+ almost as a subset of your Google My Business efforts, but they’re completely separate. So rest assured, your company’s Google virtual tours are safe. Google wants Google+ users to know that if you don’t back up your data before April 2, it will be lost forever (well, sort of). According to a Reddit message posted from the Internet Archives, if you don’t back up your content and delete your Google+ by April 2, public posts will end up in the Internet Archive. The safest option, if you want to keep your Google+ data, is to back up by March 31 because it can take some time to download. If you don’t want to lose your Google+ data and/or have it archived on the internet, you’ll need to take appropriate actions to save what you’ve posted and any other content. 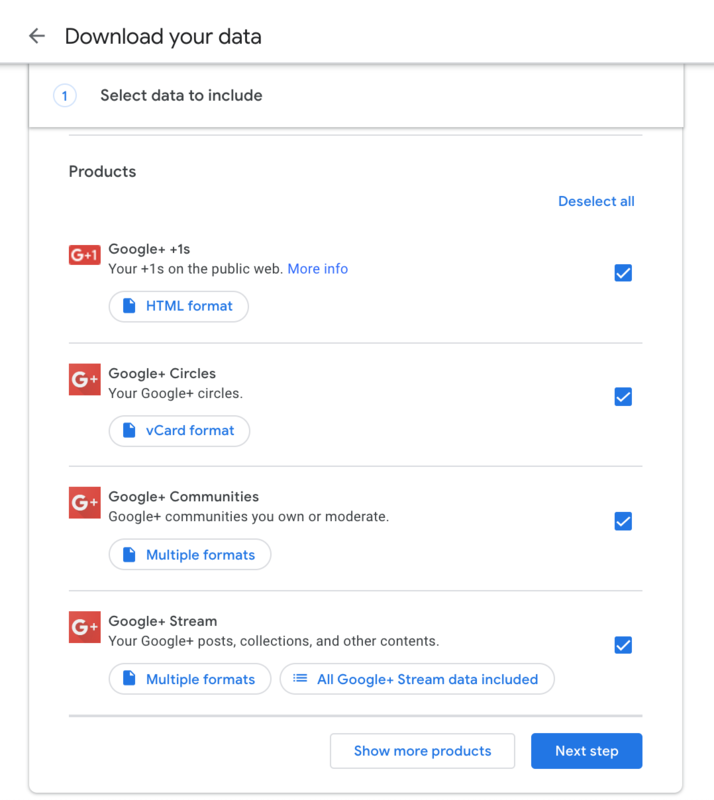 You can export and download all of your Google+ data, including your circles, Communities, Streams and +1’s. To begin, visit your Google Account Download Your Data center. You may need to sign into the Google account that owns your Google+ page. Your Google+ data will be preselected. Then, choose a file type for download. You also have the option to download specific Google+ data. 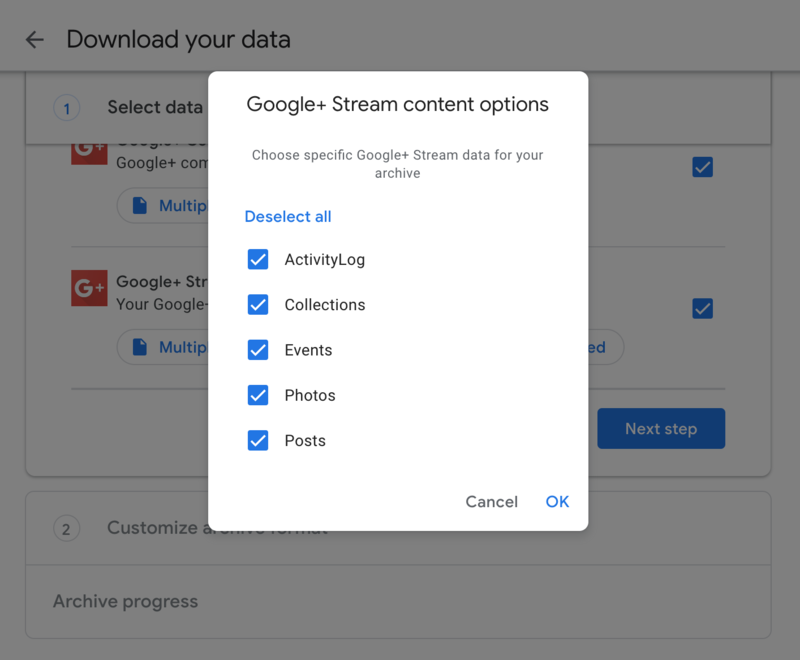 To save photos, videos and other content, click on “All Google+ Stream data included” and make sure you’ve at least selected the “Photos” option. Once all of your content is ready to download, you’ll receive an email from Google. Open the email and click Download archive. You can choose to store your content on your device or upload to Google Photos. Sign into your Google+ account. Click the drop-down menu in the top left corner. Select Settings. Scroll to Disable Google+ and from here you can delete your entire profile. Scroll to the bottom and check the box next to Required. Deleting your Google+ account is only necessary if you don’t want any of your company’s content saved in the Internet Archives. Otherwise, you can sit tight and just let your Google+ page disappear into oblivion. We recommend reading the entire Google+ Help article to walk through their specific backup instructions.